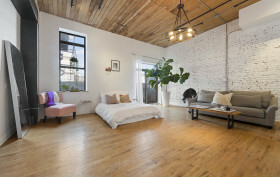 You have every reason to look up at this Williamsburg apartment, renting for $4,500 a month in the condo building known as the Smith Gray. The blue cast iron facade of the building is striking, and this loft manages to also embody some of that industrial charm. 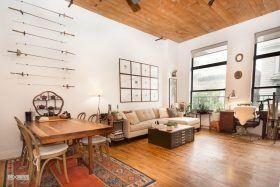 The 13-foot ceiling is lined with raw plank wood, offset by iron beams and a chic ceiling fan. Exposed brick lines many of the walls, with wood flooring that mirrors the ceiling. Such a material-rich apartment deserves good interior design, which the owners provided with a nice selection of modern furniture. This expansive Williamsburg triplex was once a part of the flagship retail space for a children’s clothing manufacturer–when the cast iron building was constructed in the 1880s, the first floor held retail while the sewing machines, shears and bosses occupied the upper floors. Now the building, located at 138 Broadway, is known as the Smith Gray condominium, and this apartment is asking $2.3 million. Over 2,300 square feet, you’ll spot tin ceilings, Corinthian columns and exposed structural brick. 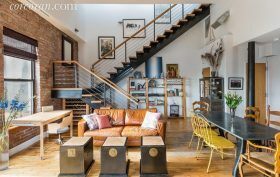 While those are pretty typical loft details, this apartment boasts one of the more unique lofts in Brooklyn. It’s clad with reclaimed cedar from New York’s iconic wooden water towers, which results in a cozy loft enclosure that can be opened via specially-designed casement windows. 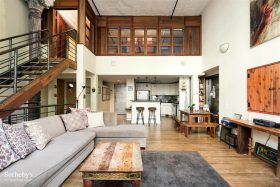 This is penthouse loft living at its finest at the Williamsburg condo 138 Broadway, also known as the Smith Gray. Constructed in 1884 as the cast-iron Smith and Gray Department Store Building, this building was converted to condos back in 2002. This unit last sold in 2006 for $1.2 million and now it’s hit the market for twice that much. 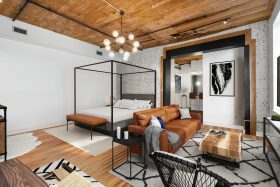 The three-bedroom, three-bathroom penthouse boasts ceiling heights anywhere from 9 up to 25 feet, with lots of the building’s original exposed brick on display.